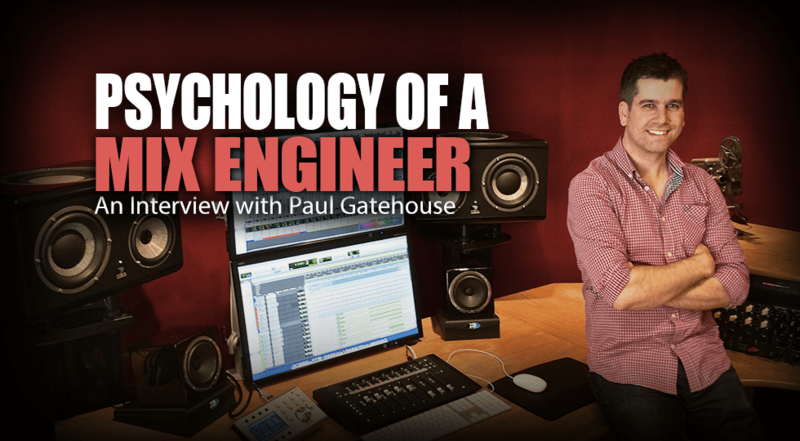 Paul Gatehouse is a freelance mixer specializing in commercial music in all mainstream genres. 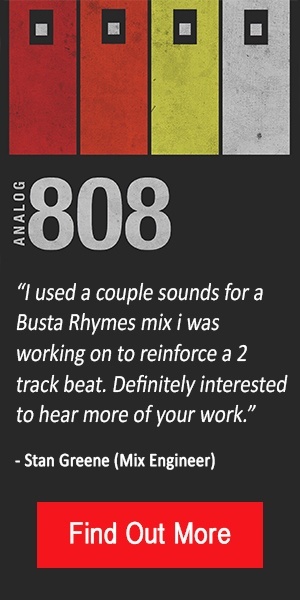 Based at LA Sound Studios in West London, Paul is fast becoming one of London’s most sought after up and coming mixers. With a background of over 14 years in live engineering and sound design, Paul brings his experience of live performance and musicality to his mixes. Recent releases include albums for Janet Devlin, Nell Bryden and Honey Ryder and singles for Alistair Griffin and Shinhwa’s ‘This Love’ which charted at #3 in South Korea, #1 in Taiwan and #5 in the Billboard K-Pop chart. This was the lead single form their recent album ‘The Classic’. Can you explain how you got started in the business and then how you transitioned into focusing on mixing? Absolutely. I came into the industry almost immediately after coming out of school. I started work experience (I think you guys call it “interning”) at a radio station in my hometown of Plymouth in the South-West of England. I learned to play guitar at school and was also heavily into the equipment and the sound engineering side of things. I always knew that was sort of the direction that I wanted to go in. Although I was a pretty keen guitar player at the time, the engineering side took the lead in later years. I became involved, through some voluntary work, with the theatre there. Luckily for me the theatre in my hometown was on the leading edge of many of the major musical productions (all the tours that would come through) as well as the self-produced productions. So I was fortunate enough to get my start in Sound Engineering by working where a lot of things were happening. I think that because I was there all the time and I was so interested, they threw a lot of things my way. I quickly progressed to mixing shows, designing sound effects and eventually was given the responsibility to work on my own with the creative team in the studio theatre. Although I initially wanted to get into studio engineering, the theatre (through the internship) was the first path that led me into the professional side of the industry. After working there for about 7 or 8 years, I progressed by moving up to London and into the real melting pot of the industry, where everything was happening as far as musical theatre is concerned. I became a mixer on some of the big shows like The Lion King. From there my interests turned to the production and sound design aspects and through fortunate circumstances met Mick Potter, an eminent Sound Designer in the industry, who gave me the opportunity to assist him, which turned into to me becoming his associate. That led to extensive travel around the world being what’s known as an “Associate Sound Designer”. You’re basically the right hand man to the sound designer and you’re responsible for mounting replica productions around the world as well as new productions. I also used to mix the shows when they were first opening and in production, the highlights being many of Andrew Lloyd Webber’s and Cameron Mackintosh’s productions. So during this time I did a lot of extensive programming, sound FX creation, working with live orchestras and performers. The scope of these sound designs was huge and I learned many technical disciplines as well as professional ones, interacting with highly skilled musicians, actors, composers, producers and co-creative’s. It was the very top end of the game, if you like, although I was still interested in the recording arts and music. Not having the opportunity to visit studios in my hometown, it was through the theatre work that I was able to go to the big studios in London and get a taste of what they were about. Jumping about ten years ahead now I felt the time was right to keep moving forward and obtain my own equipment because of how accessible the project studios were becoming. I acquired my own Pro Tools system and my own space to try and make a go of being a full time mix engineer. And at this point, how long have you been focusing solely on mixing? I found my own room back in May 2012 and before that I was doing a lot of stuff at home. I did a lot of mixes for friends, you know, speculative projects, and I did a few short films. Obviously, your acoustic environment is key, so I started hunting around on the Internet for somewhere to set up. So I think the last 3 years I’ve really been focusing on mixing and actively transitioning from associate sound design in theatre to being full time mixer in the commercial side of the music industry. If you’ve only been actively mixing in your space for 3 years, full time, how have you acquired clients that are willing to pay you a sustainable wage to live and grow off of? That’s the hardest part really and I’ve sort of had to balance the two very carefully. For the first two years of having my room, I wasn’t here very much because I was still out doing a lot of travelling. I would spend eight weeks in Japan, then head to Germany for two weeks and I’d come back to the studio for a couple of weeks. So it was very hard to gain some momentum in the early stages. I think a lot of that time was taken up by doing work that was purely spec just to get my show reel up but also to make those all important new relationships. So far this year I’ve mixed albums for Janet Devlin & Nell Bryden, plus a couple of single releases. I think this year is the first year where I feel like I’ve really got my foot on the first rung of the ladder in terms of feeling like it’s been a solid start to the year with these releases under my belt. Then you have to make that scary decision of politely declining the work that’s offered to you and dive into the murkier waters of the music industry [Laughs]. But I’m lucky enough to know a core of people who have given me opportunities on a few projects and I’ve managed to make that work. Is there any advice you can offer to someone who is trying to build up his or her contacts? How do you go about getting new clients? I’ve heavily relied on my existing relationships, especially through a friend of mine, Lee McCutcheon who’s been a writer producer on a lot of the records that I’ve done. 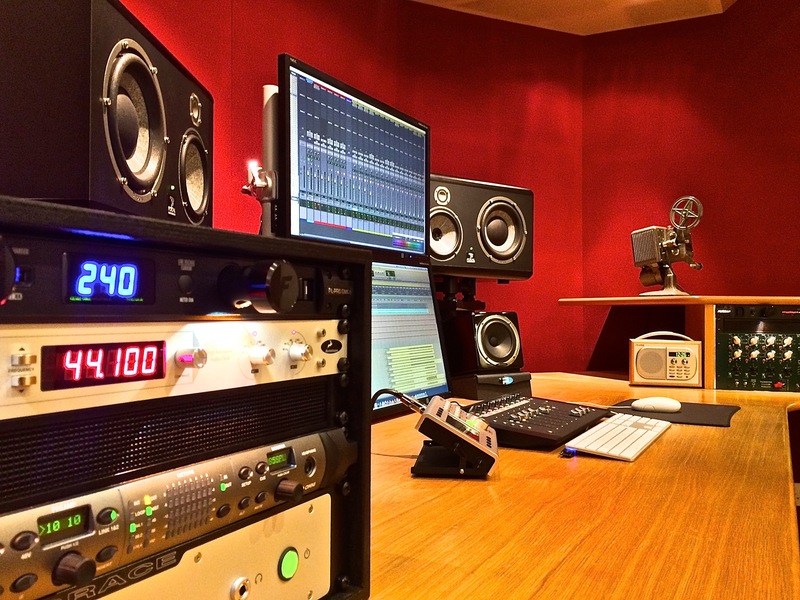 Also Jon O’Mahony who is the owner of the studio here, he also writes and produces and is always extremely helpful in talking about and sharing information about every aspect of the business. So I think it’s just doing what you can for the people you know and then trying to let your work grow from there and be heard by others. I think the important thing is that you’ve got to create a small body of professional work that can speak for itself. I mean if you start with zero clients it is really hard just to get that ball rolling but if you do a lot of speculative work for people, without you realizing it your name gets thrown into the conversations. I’m not one who goes out and majorly networks. I do what I can to meet new people and try to offer something. I hope that when there is an opportunity, I’m fairly good at making it known that I’d like to be involved. I’ve noticed that your set up is hybrid but most of what you do is inside the box. Can you talk about your setup and explain why you decided to go hybrid instead of going 100% ITB? I have the Thermionic Culture Fat Bustard valve mixer and I chose that because I wanted something that would give me some colors to play with if I wanted them and also something that had plenty of features to manipulate the sound. I didn’t just want a passive summing mixer or something like that because at this stage that doesn’t really add anything for me. As soon as I start mixing something through the Fat Bustard, I’m immediately starting off with something that sounds bigger than it was before. It’s packed full of features in terms of everything that would normally apply to the stereo buss like Pultec style shelving filter EQs, stereo spread and a low frequency to mono circuit. I really like the sound of the valves, the EQ and also the attitude control. With the attitude control, it gives me a variable amount of harmonic distortion. I have a base setting that I always start with and I can adjust accordingly. I don’t have that many outputs right now because I have an Avid HD Omni. I have my Fat Bustard inserted on my Mix Aux at the moment. 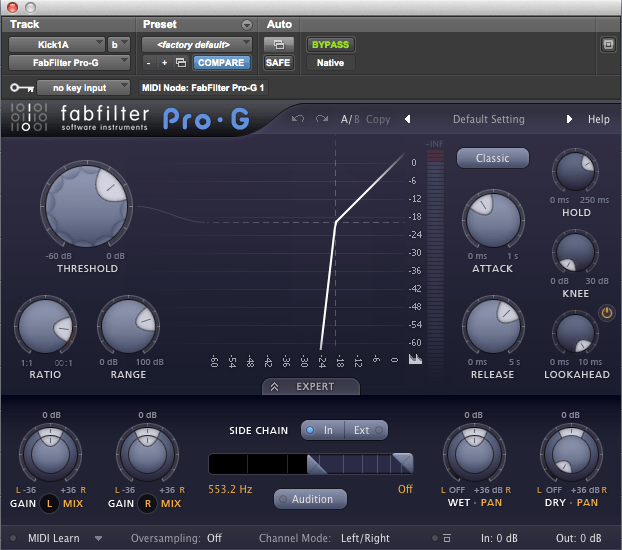 I’ve really been able to learn what it can do because you can bypass the inserts in Pro Tools. The sound and flexibility was important. 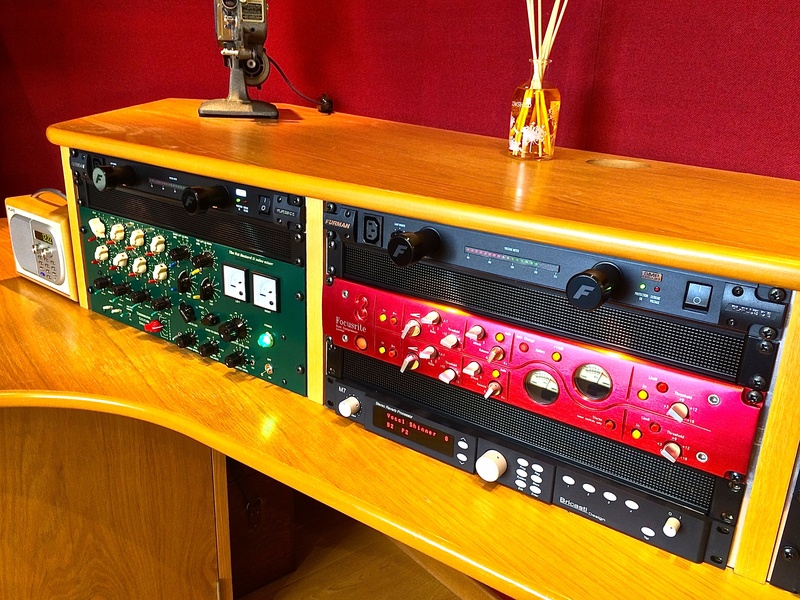 I also have a Focusrite Red 3, which I’ve had a bit of experience with in the past and I know they’ve got a tight sound, which I like. It also has a little bit of a forward sound. 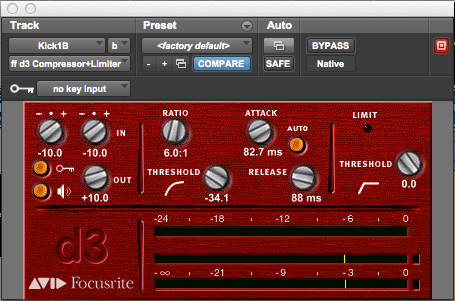 So the outputs of the Red go into the first two channels of the Fat Bustard and that returns back into Pro Tools. That’s always living on the stereo buss at the moment and in the future I plan to run more outputs going through the Fat Bustard to see what that does. And what monitors are you using? Any other gear we should know about? I originally started out with the Munro Acoustic Egg 150 monitors, which were good but a friend of mine was using the Focal Twins and I really liked them. 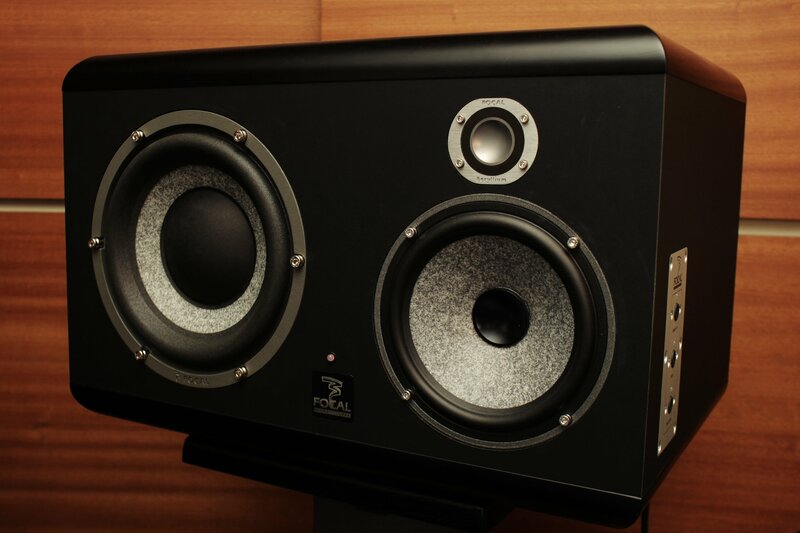 At that time Focal just had released the SM9’s, which we got in on a demo and we both really liked them. Since we work together a lot we each got a set at the same time. We throw a lot of projects back and forth between our two rooms. Incidentally, Chris Walls (Level Acoustic Design) tuned both our rooms in terms of speaker placement and corrective EQ as we were trying to get the closest match we could get in terms of the equipment that we use and the sound of our room. This way we have a base of reference with what we are listening to when we’re throwing stuff back and forth. I’ve also just got the Grace M905 Monitor controller, which has given me a lot more flexibility in terms of monitoring inputs and speaker outputs. I have my Avantone MixCubes and a little digital mono radio. I wasn’t overly blown away by any of the reverb plugins out there at the time and I knew of the Bricasti so I factored that into my budget as one of my early pieces. I really started with just the Pro Tools rig and the Bricasti, the extra outboard I’ve been building up as I go along. I clock my system from an Antelope Isochrone OCX master clock. I also noticed that you have the Avid Artist Mix. Yes the Artist Mix, which I think I would be lost without because I’ve spent so many years mixing live audio on a console. I still find mixing in the box confining in some ways just because I can’t get to everything that I would like to as quickly as I would like to get to it. There’s such a link between my ears and my fingers that when I’m moving the fader with the mouse I just don’t hear it the same way. I really enjoy having the faders and I’d like to get a few more! I mean another one of these would be ideal. I’m okay operating plugins on the screen and sometimes I’ll map them to the controller because it’s good to look away from the screen and just turn the encoders on the Artist Mix to adjust the plugin. But definitely faders in terms of writing automation, doing rides, and general balancing is my main thing. I mean I’m generally always on the faders. This is something that I’m always curious to know with every engineer but how long does it take you to do a mix? I would say that I would use up all the time that I had available to me, which may or may not be a good thing! But normally I’d say I’m 90% there within 8 hours and at that point it’s good to get someone else’s ear on it. Whether that’s someone that I’m working with at the studio or I send it out to the artist or producer to get feedback and then I would try to finish it the next day. I always welcome as much feedback as possible because that immediately opens up avenues with places to go and stuff that you just don’t hear when you’re so close to it. You might not necessarily hear that the snare drum is too loud next to the vocal, it might be the most obvious things in the world but unless your attention is drawn to it, because you’re focused on something else, then you won’t hear it as subjectively as someone else. I would say I spend a good 2-3 hours on the preparation side of things in terms of looking at the arrangement/structure of the song, phase relationships between the individual sounds and then I’ll sort of dig in. I’ll get to a point where I’ll print a version, listen to it at home on a few devices and then come in the next day to carry on. The last album [Janet Devlin] was done within a very tight time frame so we were mixing a song a day on that one for two weeks. We were working really late, usually until 4 am. I definitely become invested in the music and like to commit to making it sound as good as possible, the time factor is not important to me. One thing that a lot of the veteran engineers have told me is that they didn’t even know mixing was a thing when they started or they just it did because it had to be done. You’re a fairly young engineer so was deciding to be a mixer a conscious thing or was it similar to what the other engineers have said? Yes, I think the way the industry has evolved with there being a specialized role for a mixing engineer, which definitely appealed to me. It was something that I realized I could turn my talent to and make it a long-term career prospect; to be involved with the industry that I wanted to be in. Before that, when I was at school it was still very much the big studios that everyone was working at and it seemed to me to be an untouchable industry in terms of having access to it. There weren’t really any options at that time, so I took the first opportunity available to me in terms of getting in and being involved with sound and music. I would like to experiment and further my experience in recording, especially orchestral and film score work. That really appeals to me. I’m not going to put myself into a pocket of just being a pop mixing engineer because there are many sides of the industry that I would like to be involved in. I’m excited about the opportunities and relationships that are going to develop over the coming years. So London is your home base right now but do you think that not being somewhere like L.A. or New York hurts you in regards to getting gigs or do you feel location is irrelevant at this point? In terms of meeting people, it helps to be in one of the big centers of music, but then again you never know where or when the next opportunity will come from, so I don’t think it matters where you are. I’ve had a few requests from guys all over the world because of a music collaboration website called SoundBetter. Obviously London is a major player in the music scene so it helps to be here, but I think you can find music anywhere. The part of London that I’m in is really busy in terms of music; there are a lot of studios around here so there’s quite a community of people. There was a track on your site by a Korean artist named Shinhwa, I was just curious how that gig came about. That came through Lee, who has done a few things in the KPop genre before and has a publisher in Asia. Obviously the JPop and KPop markets are huge in terms of the turn over of music that they do. Shinhwa in particular, were looking for more of a tougher pop sound in terms of the production and the mix. So that came through his contacts and it ended up doing really well out there for them; it charted well. So there again, that’s an introduction into a whole new sector of the industry. Now moving into a more technical question, was that kick drum a conscious decision? It sounded huge but yet it didn’t trample all over the mix. That was definitely something that Lee (the producer) was going for in terms of the samples that he chose and the compression we were using to get the front end to punch on it. We referenced a lot of Will.I.Am and David Guetta-esq music to make sure that what we were doing stood up to what’s out there. The sound of that was a little bit of everything I think in terms of the samples and the channel processing. I mean it all starts with the right sound basically but it probably was a couple of samples layered together. On that one we had the API 2500 on the master bus so that gave it a lot of weight and we had a fairly slow attack on it which would have given it a bit of poke. They also did a great job on the mastering, which always helps. As far as the pay from the Korean gigs, do they compare to the American/European gigs? I’ve only really done the one KPop song so I don’t think I really have a broad enough scope to know if there is much of a difference between the US and Asia in terms of the monetary side of the business. I mean every single project that I’ve come across has been so vastly different in terms of budgets. Much of the work I’ve done so far has been self-funded by the artist. A lot of people are doing that, where they self fund their own writing, production and recording process and then use label services to promote and distribute it. I’ve been seeing quite a lot of that recently. One thing I noticed about your records is that when I turn the volume knob up (to feel it) it almost sounds like the speakers disappear and it’s just the music and me. Are you consciously creating an experience for the listener, similar to what I described? That’s absolutely what my mind’s ear goes for- maximum transparency, but also maximum punch. In terms of what you’re listening to, I don’t want it to sound like it’s coming out of two speakers. That stems from the theatre sound design because you want things to be big, immersive, emotional and expansive but you don’t want to notice it working too hard or anything that takes you out of the moment. So I do tend to go for a very deep and wide space. I like frequencies to be in check so nothing disturbs the listening experience. Serban Ghenea is a master of this and he is someone I really admire. Vocals can be very harmonically complex where it can be sounding great and then all of a sudden there’s like a frequency that just nails you to the wall. That kind of thing completely ruins the listening experience for me so I try to keep things quite neat and tidy as far as harmonic content goes and I think that adds up to a clear and open mix that you can turn up loud. What do you mean when you say you want to keep the harmonic content tidy? Basically if a singer goes for a certain note in their head voice and for whatever reason there is a sharp resonance, you don’t want that to be uncomfortable or distract your ear. 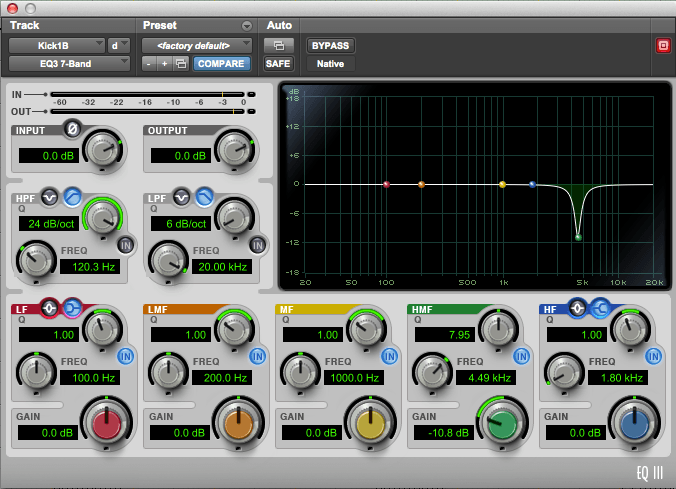 Tools I like using for that kind of control are the McDSP AE400, which is their active EQ. The harmonic frequency content of a vocal changes rapidly and you can really dial in on unruly peaks, especially when it’s right up at the front of a mix. You talked a little bit about vocals and I noticed that your vocals sit really nicely in between the speakers so do you spend a lot of time on the them? Would you go to them first when you start working? I think it’s about 50/50 whether I start with the vocal or the instrumentation. I keep trying new approaches to see if one is better than the other [laughs]. But yes, I’ll start with a vocal on it’s own on the Focals and just listen to the general tonal quality of it. I can generally tell, just by listening to it, if it’s pleasing to me from a frequency balance perspective. And then it’s a case of dialing in a tone that’s right for the song. 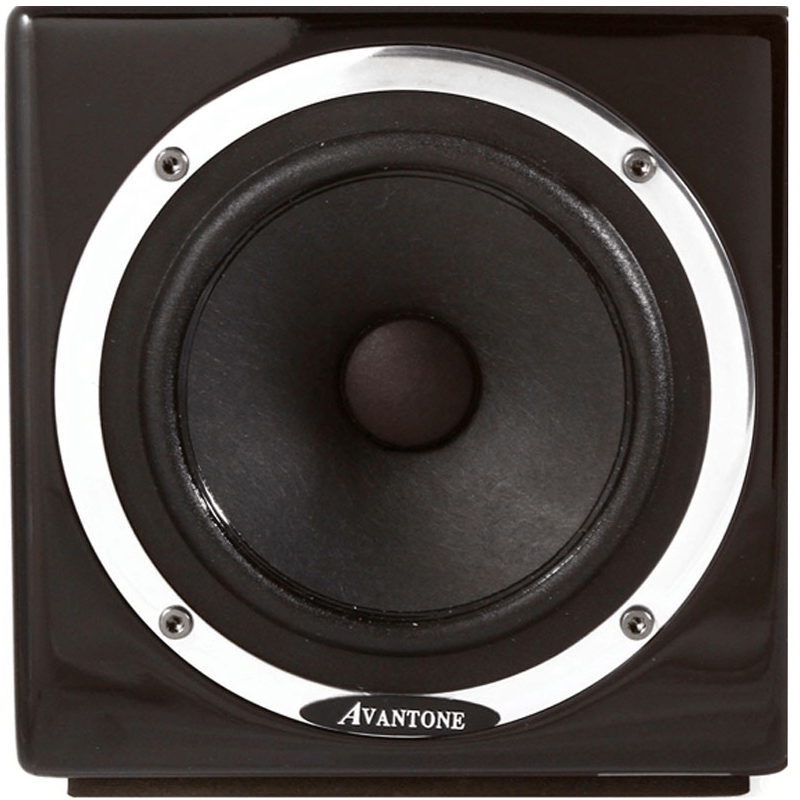 I actually spend a fair amount of time on my Avantone speakers because I feel like I get a good picture as to where the vocals (and supporting instruments) sit in the mix. Also, they tell me quite a lot about that 2k range and how pleasant it is to listen to in that range. I find that with the SM9’s if you put the vocals in a spot where they sound balanced, the vocals may appear to be a bit lower on other systems. 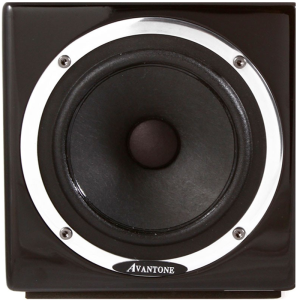 So I think between the avantones and the SM9’s I get a good picture because they’re a bit too forward on the Avantones and bit too far back on the SM9’s. With those two devices, the laptop and the radio as well I get a good general picture of the overall balance. Okay, so maybe continuing with the vocals, is there any vocal techniques or plugins that you find yourself gravitating towards? 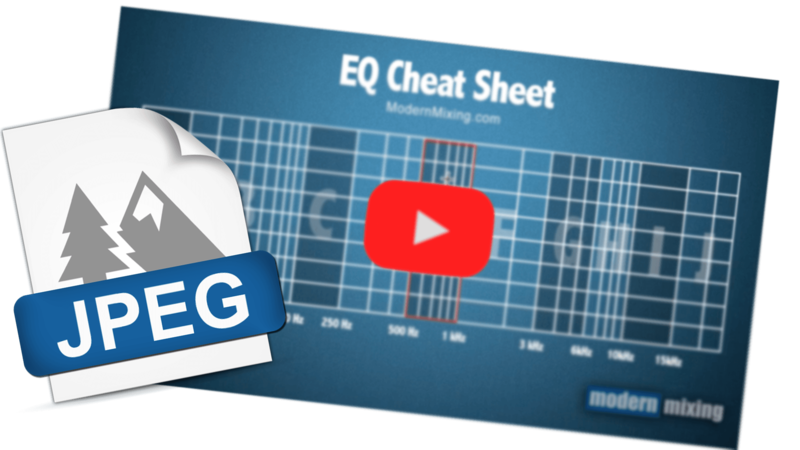 If the vocal is very dynamic then clip gain or a volume ride, pre compression, can be a big help. 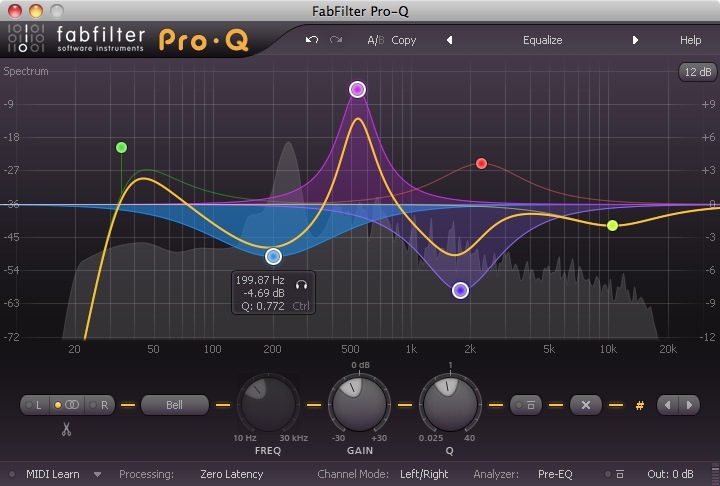 Generally I would start with maybe a FabFilter Pro-Q because I always like to work from the bottom up in terms of looking at what the low end is doing. 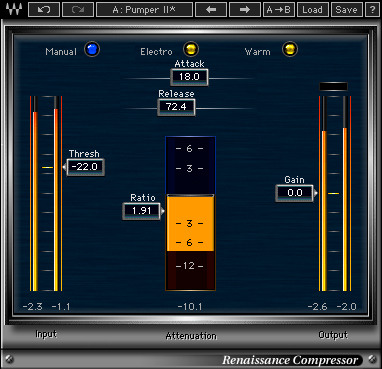 I’ll also maybe duplicate the track and do some type of parallel compression with something like the Waves RCompressor. I’m normally using some kind of distortion, which I find gives a useful weight to the sound or add some bite. I’m still trying out a lot of things really because I’m not set on any plugins in particular. 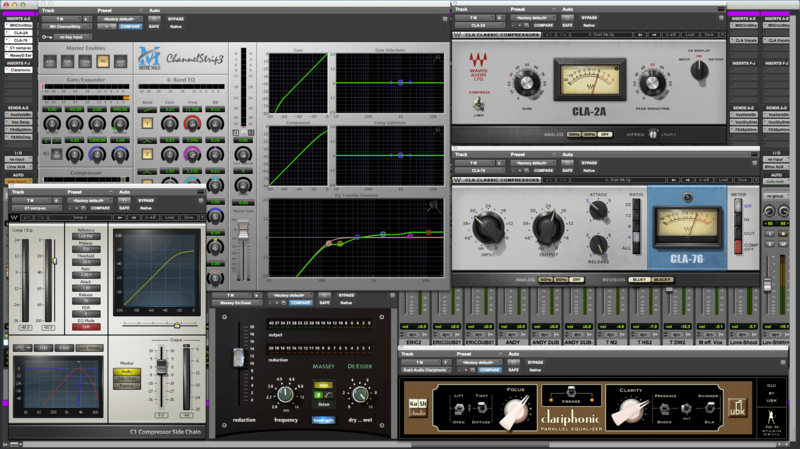 I just got the Scheps73 from Waves, which I really like and the Waves SSL Channel Strip is always a favorite. You mentioned the distortion, is that directly on the vocal or would you add that in parallel? I normally start with an aux track with maybe a Lofi on it, the Sound Toys Decapitator or the Manny Marroquin Distortion plug-in which is cool. There’s a ton of different options as far as flavours go that you can conjure up if you wanted to. Then I’ll usually EQ the distortion to take out what I don’t want and leave in the bits that I do want. Distortion is a fantastic tool to be able to guide the ear to pick things out. You’ve said that being a live engineer helps you bring out musicality in your mixes, is there any way to explain how you do that from a technical perspective? I think it comes down to the dynamics and the drama. In the live world you have a huge amount of headroom and dynamic range that you can play with in terms of what you can do with the orchestra which you can really ride and contour around the vocal, it’s just the way I hear things through working with live performance. Technically, in most genres I guess that would come down to the arrangement and extensive automation. I’m always trying to find new ways of making things have impact. And how much of that would be automation? Loads. If you look at one of the sessions, it’s just riddled with automation in terms of the transitions from the verse to the pre to the chorus and sends to effects. In the live world, you’re riding a vocal performance and you’re feeling what that performer is doing so you sort of have their voice attached to your finger. I do the same thing with the recorded vocals so they’re never losing their focus in terms of their place in the mix. The hook is usually “the moment” of a song so would you start with that and work backwards or do you have a different way that you approach that? Generally I think I’ve got the best results when I’ve started from the busiest sections of the song and getting all of that to coexist. A large initial part of the mix (the balance) is spent finding a place for everything in the busiest section of the song, not with automation but just a static balance and then work outward form there really. Whether that means taking things out from one of the other hooks, muting something or turning it down with automation. I generally tend to split the vocals into verse and chorus tracks so I can easily have control over different effects and tones. I also use the old trick of saving some of the wider effects to come in on the hook. Speaking of effects, something that I noticed about your mixes is they tend to have a fair amount of tasteful effects going on. Is that something you are adding quite a bit of to the tracks or have you just figured out a way to trick my brain into thinking they are there when they aren’t? I think I generally have a couple of spaces going on. 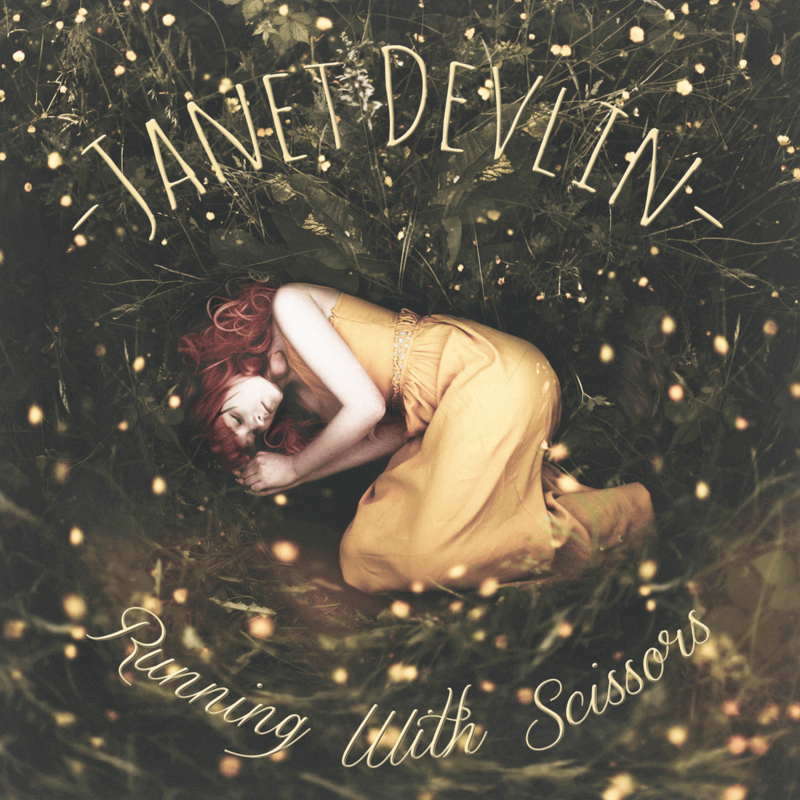 With the Janet Devlin songs it was mostly about feeling like people playing together in a room and sort of keeping it real in those terms. That’s not the kind of music you’d go all out with special effects, if you will, but you’re using effects to conjure up certain feelings or a sense of openness in the choruses by going from a vocal reverb in the verse to a delay in the chorus. I guess that tricks your mind into telling you that there’s a change or a feeling there and that things have gotten bigger. On top of that, I’ll often apply effects to individual tracks like on an insert. Maybe there’s a percussion instrument and I just want to create some sort of space around it so that it doesn’t appear that it’s too far forward. I often use the Haas effect to image sounds a lot or the Waves S1 Imager, so that could feel like an effect as well, but it’s just time or Mid/Side manipulation. 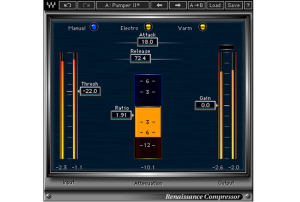 I know the RCompressor quite well and I know what the attack and release sound like. 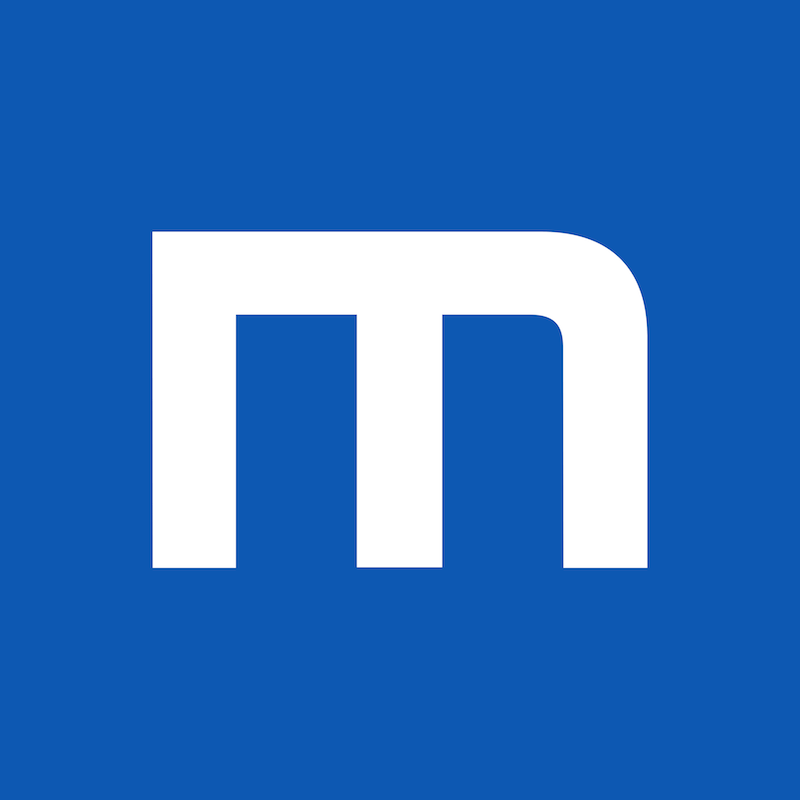 It’s not a tool that’s going to solve every problem or give you tons of character but it’s a good broad stroke, in regards to spotting a problem or wanting to change a sound and needing a tool to do it. I guess it would be between that and the CLA compressors from Waves Audio. But it all depends. On the song that I’m working on now, it’s a male led rock song, so immediately I would just reach for the Waves CLA 76 for that vocal. Whether it sounds like a real 1176 or not is irrelevant because it’s a plugin that I just like the sound of a lot. Just out of curiosity, do you normally buss your drums in every session? Yeah, I do actually. My general structure of a session is I have a vocal aux, a music aux and drum aux, which I then sub down to a mix aux. So what do you send out to the Fat Bustard then? That’s on the insert on the final mix aux, at the moment. Oh, so your just using it on your master bus? Yes, but when I get the opportunity to upgrade my convertors I can then send those individual auxes out the Fat Bustard. Then maybe break that down a bit more by adding a guitar aux or something like that. So how many channels could you send out to the Fat Bustard if you wanted to? The Fat Bustard can take 14; I can do individuals or sub groups. Do you set everything up the same with every mix or do you have to keep notes of your analog gear for every mixing session? I have the same starting point and then if I change anything I will take a picture of it for recall. So you take a picture with your smart phone? I do, but it’s generally a tweak of EQ or a different attitude setting. In terms of the gain structuring, that’s always the same. I’ve calibrated everything so that -20dB in Pro Tools is 0dBVU on the Fat Bustard and the Red3. My levels inside Pro Tools are what they would be in comparison to the analog domain otherwise you’re just hammering the convertors and the analog gear and not in a good way. I like having plenty of room to maneuver in the digital domain. Back to the drum buss, I’m actually curious as to what you would put across that. Depending on the music, my first thought would be how punchy (or not) do we want the drums to be? How weighty or bright? So that would lead me to reaching for the right compression and harmonic enhancement or EQ. I use the DAD Tape and straight away that gives a nice bit of warmth and then various other compressors like the API 2500 or the new Slate VBC plug-ins. Then maybe a parallel buss along side that with a Lofi or the Decapitator on it. It’s all fairly proven methods but they are techniques that work extremely well and I’m experimenting and trying to master them and make them my own. So are you more into processing the drums as a whole instead of individually processing them? Yeah, the more I do this, the more I need to do things in context, which I didn’t necessarily do in the early days. The more that my ears become tuned in then it feels like things don’t make sense unless you’ve got everything else going. I think that obviously the root of everything is balance and once you get the balance you can see what something like a compressor or an EQ might do. Maybe you want to get some punch from the drums or maybe you want them thick and soupy. Then I’ll go back and maybe look through some individual sounds. I hear that DAD plugin come up from time to time but the price is so high for such an old piece of code, is it really worth the money? I think I thought the same thing up until recently when I demoed it and it became a bit of a no brainer in terms of wanting to use it. It does one thing extremely well, in terms of giving a raw signal just a bit more something, like the weight or graininess of it. Put it on a vocal and it sounds great or put it on something where you want to round the edges off a bit like a tambourine. 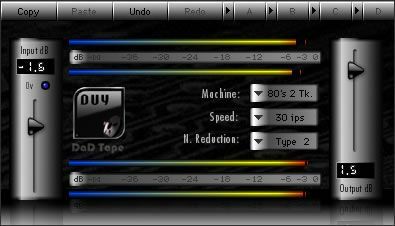 With a lot of percussion, I’ll put the DAD Tape on and then follow that with the DAD Valve plugin, which has a lot of cool settings in it. So instead of a tambourine or a shaker sounding really up front and spikey, it gets those edges sitting back where they need to be so you can really find a spot for that instrument. The DAD Valve works great on vocals and guitars. So even though they are quite expensive, I think they are definitely worth having. 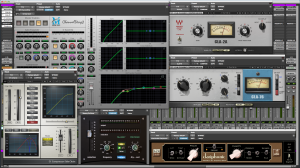 Maybe if someone is just getting aquatinted with mixing, are there any tools that you think every mix engineer should have in their tool belt? I think Sound Radix do some really interesting stuff. It’s all mostly to deal with phase coherence and relationships, which I would always look at first even before going near an EQ. If it’s a multi mic’d source, I want to know how they interact with one another or how even a kick drum and a bass guitar are behaving together in the lower frequencies. You know, even just a few years ago, I just didn’t know this stuff. Where before I would reach for an EQ to get more weight from something in the mix but now I would always look at the phase first. I think the Sound Radix Auto-Align plugin is a great tool and the Pi (Phase Interaction Plugin), which is quite a weird plugin that doesn’t always work the way you want it to, but when it does it’s unbelievable. It dynamically rotates the phase of individual channels and you can set it to work on just the low frequencies or the full range. 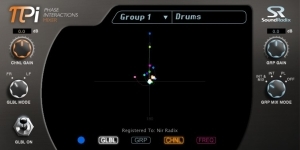 You can set it to work on groups of instruments or the whole mix. It visualizes the phase interactions really well so you can see if 50 Hz on a kick drum is negative phase versus 50 Hz on a bass guitar. If something is sounding really thin when those two things are happening you can correct that and get them to become additive instead of cancelling. 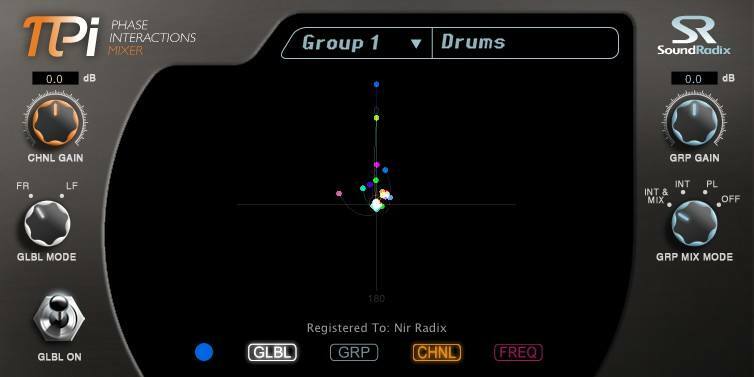 So I think that those Sound Radix plugins are pretty interesting and breaking new ground on what can be done with DAWs. I think all the dynamic tools are really interesting as well because that gives you so much flexibility like The McDSP AE400, which is similar to the Waves C4 but it’s not a multiband compressor. They call it an active equalizer. I think those are a couple of really interesting tools and that goes towards getting that transparency that I go for. Your mixes definitely have a lot of depth to them. Does depth come just from effects or does it go beyond that for you? I think it’s a combination of a number of things, level being the primary one, timbre being the second and then obviously the space that things are sitting in. The interesting thing is that in doing this and as time goes on, your ears get tuned into things like depth, width and height. They’re almost sort of break through moments in a way because I didn’t necessarily know what depth meant when people would talk about it and I didn’t necessarily know what height was when I would hear it. Once you make those discoveries for yourself and you make those breakthroughs then it becomes really obvious and easy to hear. You can hear things like phase interaction and comb filtering and once you do, you realize that addressing these can be major parts of the mixing process. You have to go through the trial and error and work out what these things are and almost hit a brick wall each time. Then all of a sudden you make a break through one day and then you feel like you’ve got a handle on it. The past 3 or 4 years have been a really good learning curve. A big thing that I learned from a friend of mine Lee, who I mentioned earlier, is learning what the flavor of a song is. You don’t necessarily want everything to sound good. It’s learning what the character and flavor of the music needs to be and often I would do too much and make it sound too correct. The mix was maybe more technically correct than it was musically pleasing. Those are the interesting things I’ve tried to get a handle on the last couple of years. Wow, what a great interview. Thank you so much for being part of it. No problem, thanks for asking me to do it. The website looks great by the way. Websites like yours and others like Pensado’s Place, just help so much in terms of learning techniques and new ways to think about things. I know for me I didn’t have an opportunity to work under someone in terms of the traditional studio route, so these online resources are extremely valuable.